I confess that when it comes to photography, I'm probably about as far from Ansel Adams as you can get. Up until recently, I thought an f-stop was some sort of invective hurled at the driver in the car next to you. Still, I like cost affordability and high-quality meshed into one compact package, which is what Nikon's going for with their new D40 DSLR. 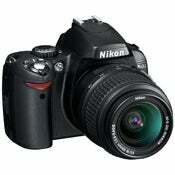 The D40 is Nikon's most compact digital SLR camera yet. It features a 6.1 megapixel CCD sensor, a 3x optical zoom lens, a 2.5" LCD, and matrix metering, which compares your photo's lighting information against a database of 30,000 pictures. It also features instant shutter response, for capturing 2.5 frames every single second. Images are stored on SD cards and the camera can also be fitted with a variety of add-on lenses. One of my friends has a Nikon DSLR that he likes quite a bit, but it's kind of a big fellow to lug around to our annual get-togethers. By itself, the D40 is just over a pound and it measures 5.0 x 2.5 x 3.7", making it a small step up for those of using compact point-and-shoot cameras. Best of all, it'll be available in December for $599, which is a pretty decent price point for DSLRs.